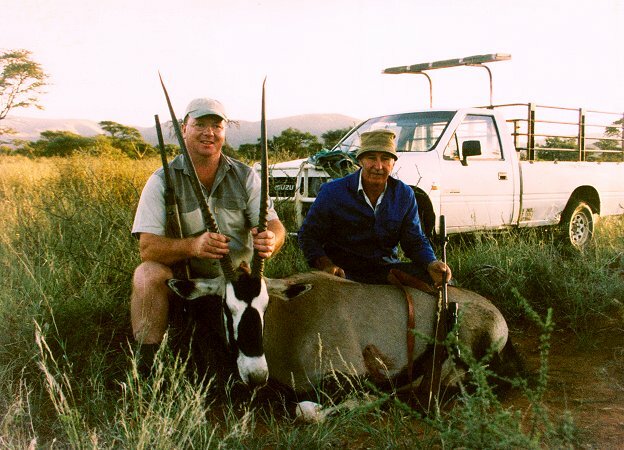 Johan Nieuwerth of Port Elizabeth hunts with a 7mm Rem Mag and a 340 Weatherby. The 38.5" gemsbuck below was taken at Dalgetty in the Northern Cape. Johan used the 340 Weatherby and after a stalk of several hours took the shot at a paced 280 to 300 meters. The gemsbuck was broadside and the heart/lung shot put the gemsbuck down in less than 20 paces. Johan loads the 340 Weatherby with 200 gr HV bullets at 3330 fps and the shot went in and out behind the shoulders with minimal meat damage, although the lungs were completely destroyed. Johan is left handed and had both his rifles custom built on left hand Sako magnum actions. The 7mm RM is fitted with a Sako sporter profile barrel and a Walnut custom made stock. The 340 wears a Walther match barrel and a stock made from laminated walnut. Johan found load development with the HV bullets in his two rifles easy to complete. Both rifles will comfortably stay at half a minute and the 7mm Rem Mag has accounted for many springbuck at ranges from 80 to 380 meters. The target below is typical of a range check before going on a hunt and muzzle velocity is 3400 fps. 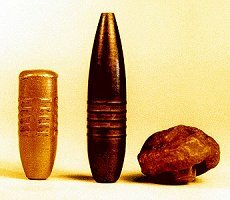 The photo of the 338 200gr HV bullets on the right includes a bullet (left on the photo) Johan recovered from a kudu that was going quarter away at a ranged 310 meters. The bullet struck to the rear on the rib cage, completely penetrated the chest cavity, followed the vertebrae up the neck and was recovered lodged against the jawbone. The middle bullet is unfired. 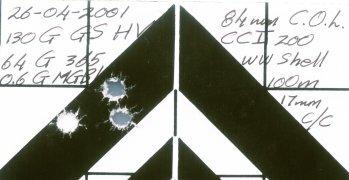 The right hand bullet was recovered from the range backstop at the 25 meter mark and weighs 200 grains.